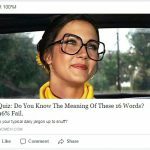 Have you taken one of the quizzes from Women.com on Facebook lately? Been impressed with your brilliance…got 100% on the quiz? Well, maybe you ARE brilliant, and maybe you DID get 100%. But if you have a creepy feeling you’ve been used–you’re unfortunately right. Women.com has been putting up a number of quizzes lately where, if you get anywhere close to most of the answers correct, it’ll report you as getting 100%. Why would they do this? Well…so you’ll share it on Facebook. If you scored 65%, you probably wouldn’t be proud enough to share it. So, by faking your score to make you look like a rockstar, they greatly increase the chance you’ll share their quiz on your timeline. I’ve done this quiz (and a couple of others they’ve run), and deliberately answered 3-4 questions incorrectly, and still….100%. I then tried answering all of them deliberately wrong, and didn’t show 100%. I’m guessing they did this to make it look legit for someone who either was testing them, or knew they knew hardly any of the right answers. They’re using you, by deception, to market their site for them on Facebook, for free.